BestWindowsHostingASP.NET - When it comes to web hosting, you have more options available now than ever before. From traditional shared or dedicated web hosting to new and revolutionary cloud hosting, finding the right solution has never been easier, if you know what you’re looking for. 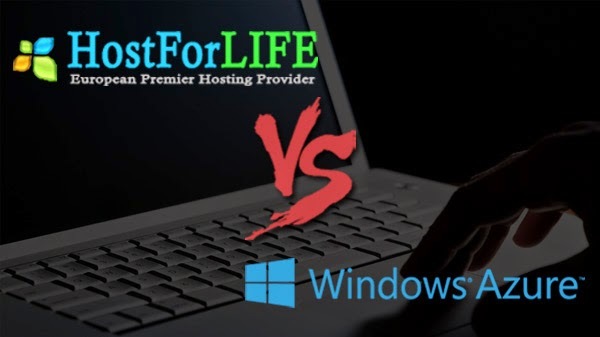 We write this in-depth comparison between HostForLIFE.eu Hosting Platform and Windows Azure to guide you figure out specific differences in their Windows hosting services. Is a fairly common technology and can simply be described as webserver space for rent. A webserver is the combination of software and hardware that serves web pages and related services in response request made by internet users via browsers and software. It’s simple enough, for a monthly payment they (the hosting companies) host your website and other services which you provide to your website visitors, its important to note that the servers are not dedicated and a single server will host multiple customers. The servers have windows server 2008/2012 as operating system and come with many useful web development tools and DBs installed e.g. ASP.NET, IIS, SQL Server, etc. It also means what affect your server cohabitants affects you, if a website on your shared server is being DOS attacked, its likely going to slow the entire server down including your running apps or website. Also you still don’t get finely grained control in that you don’t have root access to the server, you can’t install software, you have to use what the service provider offers. So what are the differences between HostForLIFE.eu Hosting Platform and Windows Azure? 1.) One of the greatest advantages of hosting or cloud computing is the outsourcing of hardware management. An enterprise can sleep a little better at night by trusting their hardware needs to companies that specialize and can guarantee up time. At a normal web hosting company you pay a fee for a fixed number of time, usually in months. The fee is based on how much bandwidth and storage space they allot for you. If you need more bandwidth it can be increased for a larger fee. Windows Azure is a little different. With Windows Azure you pay for bandwidth only as it is being used. Windows Azure also allows you to scale your hosting environment during peak times. 2.) When using HostForLIFE.eu web hosting company you can put up any code that you want. Whether it is scalable or not is strictly left up to the person writing the code. Windows Azure is a little bit different. When writing code to run against Windows Azure the patterns that you are forced to follow to make it compatible ensure that it is scalable. 3.) Web hosting provides a place to host a website and possibly even a database. Windows Azure can also be a place to host a website and store relational data, but it actually provides much more. Windows Azure allows you to run applications out on a cloud. Thick client applications, WPF applications, Silverlight applications and Mobile applications can all communicate withWindows Azure. Background services that update data in the database can be run on the Windows Azure platform as well.